First Fridays with SolEcon and Cowry! We had a wonderful Happy Hour this month! 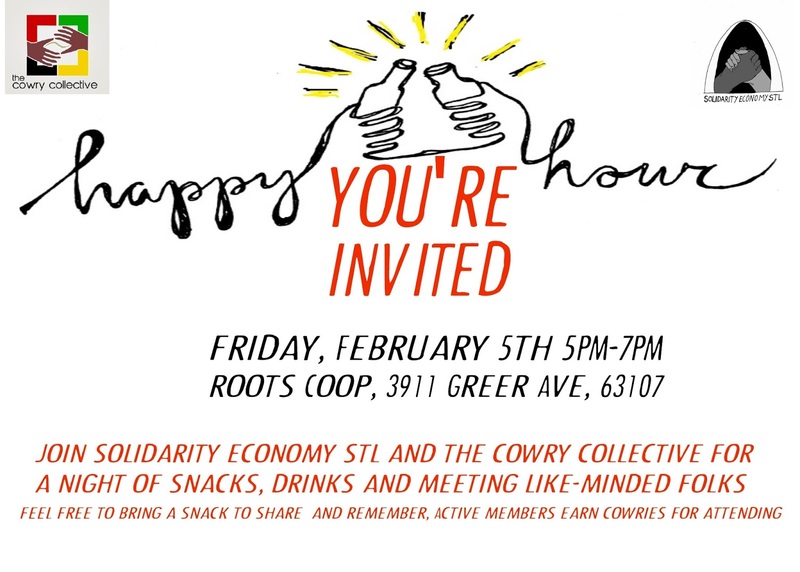 Join us every first Friday of the month for food, drink and revolutionary company! By Cowry Collective|2016-02-11T12:20:00-05:00February 11th, 2016|Categories: Archives|Comments Off on First Fridays with SolEcon and Cowry! We are a unique timebank whose name reflects the ancient practice of exchanging with currency that predates our current use of paper dollars and metal coins. Cowry shells were used as currency for centuries across the world throughout Africa and in China and continue to be used ceremonially among indigenous peoples of North America. By naming ourselves, The Cowry Collective, we give reference and reverence to these practices that have come before us and have paved the way for the alternative currency movement today. In our timebank, for every hour of service you do, you earn a cowry. (commonly referred to as a timedollar or time credit in the timebanking world). Liberation Through Cooperation = Films >Discussion > Launch!